Brewers Guarantee At Least .500 Road Trip ~ The Bucky Channel - The World of Sports from Wisconsin's Perspective. It's been a few good weeks here for the Brewers. Tonight was no exception. Tonight the Brewers really won a game they probably shouldn't have. The Crew went on to win tonight 4-3, as David Riske picked up the good old blown save win and Torres came in to shut the door and earn his 15th save. The bats came up clutch tonight as the crew got down early 2-0 and J.J Hardy and Mike Cameron chipped away at the lead adding RBI's in the 6th and 7th innings. 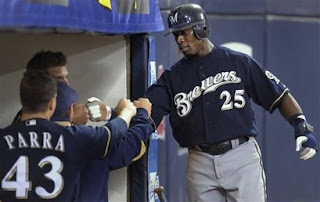 Then Rickie Weeks added a huge go ahead pinch hit home run in the 8th inning, off an 0-2 count none-the-less. After Justin Upton returned the favor in the bottom of the 8th, Cameron once again broke the 3-3 tie by driving in Russell Branyan. Seth McClung battled early woes to pitch 5 1/3 innings giving up 2 runs and striking out 6. Riske, after leaving a hanging breaking ball for a homer, settled down and pitched decently. Torres flirted with disaster with men on 1st and 2nd with one out but was once again helped out by an inning ending double play. My general impression of the game was that I was virtually on the edge of my seat all game. Truly a great game, clutch hits, back and forth scoring, and in the end a Brewers victory. It really looks like Cameron is coming out of his slump some, and J.J. Hardy went 2-4 to extend his hitting streak to 14 games. In other notes, Ryan Braun got a day off, so hopefully he breaks out in the games leading up to the AS break. Brewers still remain 4.5 back of the Cubs and 2 games back of the Cardinals for the wild card. The Crew will send Manny Parra to the bump to face Brandon Webb in the 4th and final game of the series. Game time is 2:40 p.m. FSN. TBC's Player of the Game: Mike Cameron - 2-4 2RBI. As much as the Rickie Weeks HR was clutch, Cameron came up with two great RBI singles, one to tie, and one to gain the lead.